Photo by Freddy. The summit ridge. 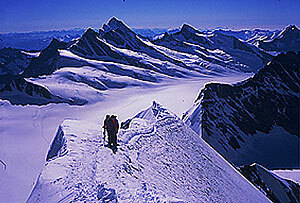 The Mönch stands between the Jungfrau and Eiger. The one-day Mönch climb is a great way to adjust to the altitude and apply your mountaineering skills to this particular type of terrain. The climb is rated PD mixed with a section of 45 degrees or ZS. 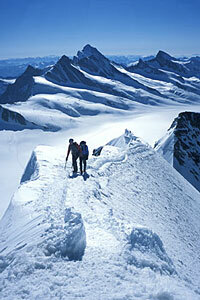 From the Jungfraujoch train station at 3,573 meters, it is a short hike to the start of the South East Ridge. 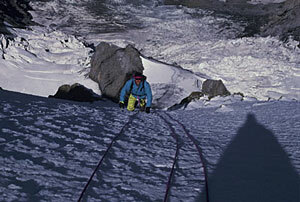 We rope up and start the climb over rock slabs to the snowy ridge. 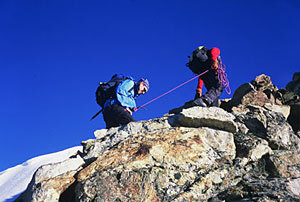 From there we climb on mixed terrain to the false summit. 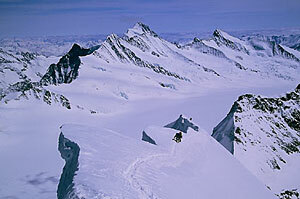 The traverse to the main summit can be quite exposed, but it has a nice trail cut into the ice by the local guides. Although this is a relatively short climb, due to this exposure, the Southeast Ridge ought to be taken seriously. A lot of people underestimate the ridge because of its accessibility. It takes about 2-3 hrs. up and 2 hrs. down. This is a one-day climb. We meet in Grindelwald or at the Jungfraujoch for the climb. We also offer a 2-day climb to give you the opportunity to improve your climbing and crampons skills on the Steingletscher, where you will be approved for the Monch by the guide. 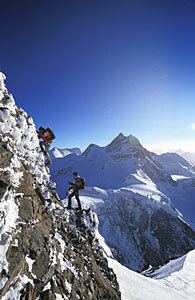 Click below for information on equipment and training plan for climbing in the Alps.